fantastic creator, face, and lot of other “f” in FlowerFelt Design (FFD) is Małgorzata Hupert – who has graduated at Academy of Fine Arts in Cracow at the department of Visual Communication in Katowice. she explores many forms of art, but I’ll focus on felt jewerly. she was the one, who create unique collection of felt necklases, earings, brooches. 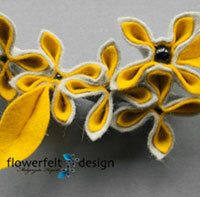 first developed a motif of felt flower – mostly two-colour, but not necessarily. then she multiplied it in an endless number of combinations – of colours and forms – creating beautiful jewerly. in the future she wants to create with these flowers lamps and other interior fittings… but now we can enjoy only jewerly, so: let’s buy it! this jewerly is excellent for gifts. I tested this! FlowerFelt Design jewerly will appeal to women of different temperaments. and those who love to dance tango, and those who feel comfortable only in large office spaces. those who love beautiful things, unique and original. if you would like to buy one of them, You can order your individual color scheme for existing designs writing to Małgorzata (e-mail: flowerfeltdesign@gmail.com) or in online handicraft shops, like Decobazaar, Pakamera artystyczna, Galeria Fiu Fiu.